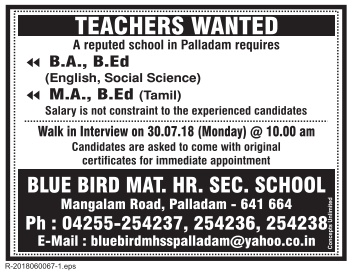 Blue Bird MHSS, Palladam has advertised in the DINAMALAR newspaper for recruitment of Teachers jobs vacancies. Interested and eligible job aspirants are requested to walk-in on 30th August 2018. Check out further more details below. About School: Blue Bird Matriculation Higher Secondary School, Palladam, established in 1981, is a self-financing day school with a current enrolment of 1500. The school has made a significant contribution towards education excellence in the Palladam region. The school is a unit of SKR Educational Trust. How to Apply: Interested candidates are requested to attend the Walk-in interview along with CV, originals & copies of certificates and recent passport size photo to the walk-in address provided below.